Hahaha holy poop. I just saw the highlights of that Van-Tor game. Dorsett threatening Babs. Miller mugging someone. Two headshots one shift. That was a total Canada on Canada hate crime. I'm still giggling at that Montreal-Columbus score from the other night. 0-10! Really? Michel Therrien needs to be out of this league for good. After all, look what happened when Pittsburgh binned him and hired an unknown. Lol thrashers. I can't believe I was once upset about Lindholm being taken over Trouba in the draft. Better player then, better player now, signed to a way longer term for less dollars. Maybe one day they'll win a playoff game. I'm a little late, but this was so bad it became magical. I watched that clip of that double-headshot (sounds like something to order at Starbucks lol) probably 20 times before blinking. Head shots aren't funny, but that sequence had me in tears. Kadri is trash. Damn, who is going to concuss all the youngsters now? The NHL decided that the Kadri headshot wasn't a headshot. Am I missing something here? I watched the clip from multiple angles and the reverse angle clearly showed head contact, severe enough to knock Sedin's helmet off. Is the NHL serious about preventing concussions or not? I don't get it. I feel like they are digging themselves a bigger hole when it comes to concussion lawsuits against the league. Should change that acronym to DoPES, be a lot better. The call was that initial point of contact wasn't the head, but that the head contact was incidental (finished his check). And being as it's brain-stem boy Kadri, he's not going to change his game because he avoided his fourth career suspension. Holy Dehydrated Donkey Dung balls Batman! Ryan Miller commits some serious grand larceny against Zetterberg. Big Willie Karlsson pots his 2nd of the year as Lumbus doubles the Blues 8-4. Gagner scored 2... 6 on the year for him now. Wish we woulda signed that dude. It was him or Rakell, if I recall correctly, we had to choose, we could not leave both. We chose right, me thinks. Absolutely, I'm not losing sleep over Karlsson, just wishing we'd picked up Gagner this summer. Guy is only two seasons removed from a 41-point campaign in AZ, he'd have been the perfect guy to bring some finish to the bottom 6 or some offensive support to plug into the top 6 in a pinch, all at a Bargain Bob-friendly price (1yr, $650k). For Bieksa? Sure. Why would we need another defenseman, though. Carolina would probably demand a Montour or a Theodore...eh. Definitely not the coach I imagined getting canned first heading into this season. He should've taken a page out of Capuano's book and moved into his GM's basement. Too late now though. I'm kinda surprised that we haven't seen any movement out of the Islanders considering their terrible start. Garth Snow must be hanging onto his job by a thread right now. Wow this is a shocker. Really no reason to fire him. Unless it's a really personal thing, there is no obvious reason to do that. He slapped the owners kids? You don just dump good coaches. This is quite ridiculous as well. I expected Arizona, Carolina, Buffalo to be in the cellar, but these Islanders...it's lower than low. And they still managed to beat us. It's looking that way. They literally called a cab for him immediately after last night's loss. Coldest thing I've seen in a while. The Islanders would be smart to swoop in here before Vegas gets the chance. Um. Wasn't he a Jack Adams runner up last season? And finished the season with a Cats record high? What a knee jerk reaction. Probably should have read the article first that explains all of that ^^. How he sti has that job is... Why? Many a hockey fan, and especially Isles fans have been asking themselves that for over a decade<---seriously, what the frack?! I'm starting to question Viola's ownership of the Panthers since this summer with all the office shuffling. And firing Gallant was just stupid. Theys have it craaaaayzee on the East coast. Shoulda just hired a Lombardi. Florida's management completely botched the termination of the two coaches. 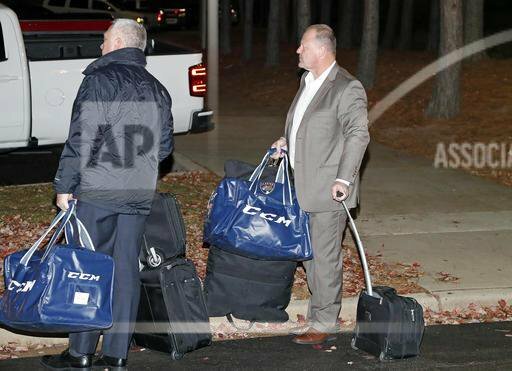 Hockey is a small industry - other coaches and players saw how things went down. Florida handled this like a bush league franchise and there will be ramifications from players and coaches wanting to land in Florida. The owner must be a bumbling fool. I grew up in Queens and on Long Island and cut my hockey teeth following Bossy, Trottier, Potvin, and the Islanders... but that franchise hasn't been able to get it together. I thought the move to the Barclay's was going to be a slam dunk until I found out that it doesn't accommodate hockey (what a stupid move by the developers). Panthers are cut of a similar clothe but got those few lucky bounces in franchise history that semi- makes them legit. A day late here but did you all see what happened in New Jersey? Philip Larsen got decked by Taylor Hall behind the net and both teams come rushing in for a melee with no regard for the player laying unconscious on the ice. They were literally jumping over his neck with their skates, dropping their sticks on his face and kicking him in the head. If all that wasn't bad enough, Kyle Quincey comes speeding in and indadvertedly runs over his head, ripping off his helmet. That could've been catastrophic if there was a spinal injury resulting from the hit. Just a total display of stupidity by everyone not named Markstrom. First Sbisa tags his teammate in the back of the head at 0:38 and Quincy does it at 0:41, while it looks like Kalinin hurdles him. Granlund straddles Larsen to protect him and pushes the scrum away, but it looks like he bumped Larsen's head as well. The MSG feed has some better slo-mo. I get wanting to wreck someone if they knock your teammate out, especially when it looks shoulder to noggin, but take it elsewhere if the guy's down. C-spine is important and rather delicate.